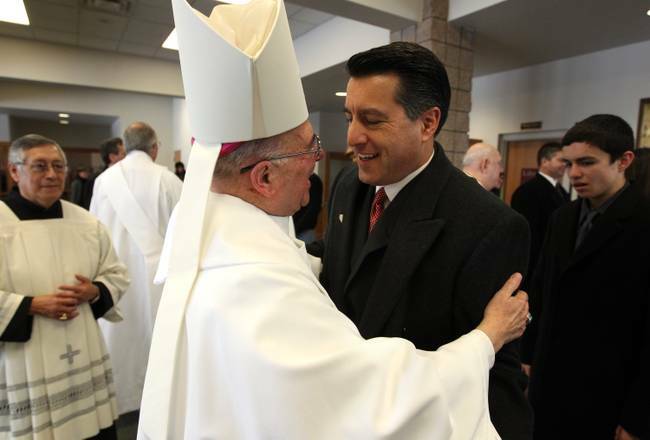 .Gov.-elect Brian Sandoval and his family began the inaugural day with a special mass at St. Teresa of Avila in Carson City. Las Vegas Bishop Joseph A. Pepe gave the homily, in which he addressed Sandoval, who will be sworn in as the state’s 30th governor later today. This is the first time in recent memory that a governor-elect has begun his day with a religious service. “The governor takes his faith personally, and it’s important to him,” said Sandoval’s senior adviser, Dale Erquiaga. Sandoval is to be sworn in later today on the steps of the Capitol Building. I realize that it difficult to be Bishop. Too often they are criticized by arm chair theologians on the progressive and ultra orthodox side. Talk about getting hate mail. But I really do not understand Bishops who confuse their flock by their actions. Pro Choice. While he does not support partial birth abortion, late term abortions, or federal funding for abortions, he still supports Abortion which is an intrinsic evil. A Pro Abortion stance cannot be mitigated. Pro Death Penalty. The US Bishops and the teaching of the Church believe that the death penalty is justified when there is NO other way to protect society. In the US it is almost always possible to protect society without resorting to the death penalty. Oh and Gov. Sandovol is a, drumroll,…..REPUBLICAN. I just don’t get cafeteria Catholics. This entry was posted in Church and the Public Square, Culture of Death and tagged Catholic Bishops, Pro Abortion politicians. Bookmark the permalink. I would call him pro-death, no if ands and buts. He may be Catholic by virtue of baptism but thats all. The likes of Harkin, Biden and others who claim to be Catholic give the rest of us who are trying to advance the kingdom a bad name. I want to be charitable but sometimes I just feel like slapping them. Sorry! I am right there with you Susan. Loving our neighbors is often really difficult. I guess that is why God had to make it a commandment!